Our largest, toughest blue palm tree! 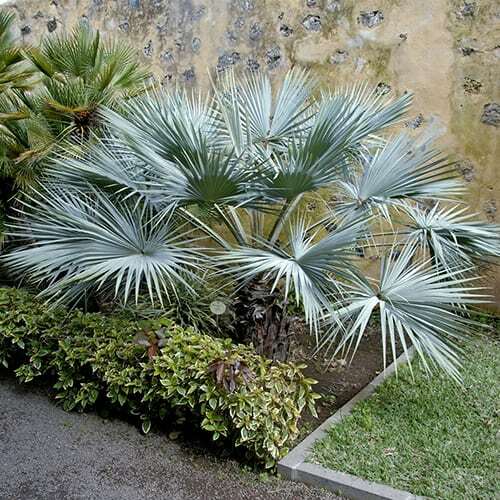 Brahea armata is also known as the Blue Palm due to its stunning fan-shaped leaves which are a striking, silvery shade of grey-green, giving the plant an overall bluish tinge. At 1m tall, it's already one of our largest, toughest palm trees, RHS awarded, and ready for instant impact! Compact, slow growing and you can enjoy it regardless of the size of your garden, and if you move, you simply take it with you without worrying about losing your investment! Brahea armata is also known as the Blue Palm and for good reason - the stunning fan-shaped leaves are a striking, silvery shade of grey-green, giving the plant an overall bluish tinge. In the sunlight the blue colour is particularly noticeable, and at night takes on an ethereal, almost ghostly shade. The bearer of many names, including the Mexican Blue Palm, the Blue Hesper Palm and the Grey Goddess, Brahea is an exceptional plant for a Mediterranean garden or as a specimen plant in a pot for your decking or balcony. As it’s compact and slow growing you can enjoy it regardless of the size of your garden, and if you move, you simply take it with you without worrying about losing your investment. With its exotic leaves spreading from a single trunk, this is a palm which brings a tropical feel to your garden - just imagine sipping your cocktail as the wind gently rustles through its canopy - and at 1m tall, it's already one of our largest specimen trees and ready for instant impact! The blue palm is drought tolerant, can handle both partial shade and full sun, and is winter hardy down to -10C when established although we do recommend protection from any severe weather as frosts and cold winds can shred the leaves. Supplied as an established potted plant, already approx. 1m tall (including pot), Brahea will ultimately reach a height of 15m in its native Mexico, but is more likely to reach around 4m in the UK with a spread of around 1.5m. Winner of a prestigious RHS Award of Garden Merit, you can be guaranteed that this is a garden-worthy plant that has been trialled and tested for its suitability to grow in UK gardens. As with the other blue palms the more heat and sunshine it has the bluer it tends to become, so plant it somewhere that gets the most sun. Grow in any well-drained soil, on the poor side (don't add extra organic matter) in full sun or light shade. If you live in an area prone to frost, you should consider growing Brahea in a pot.